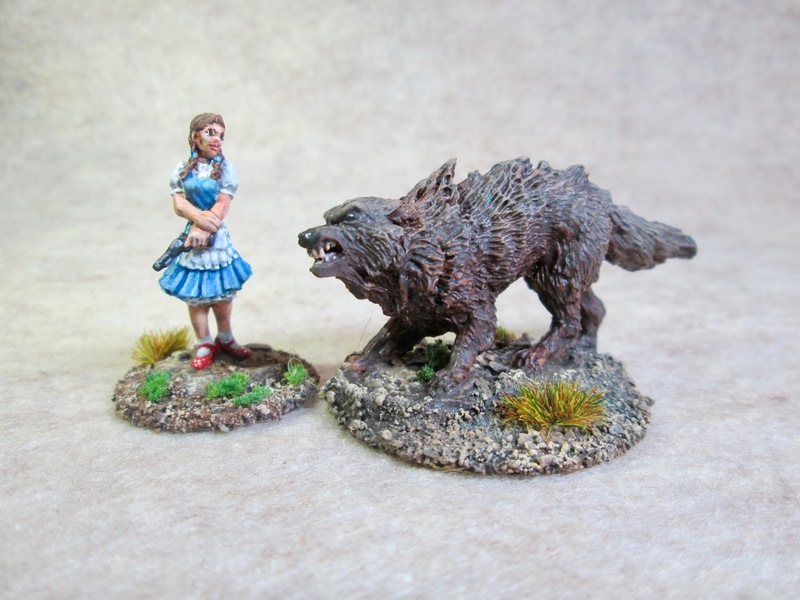 Winter Wolf Painted as Mutant Toto for the Wild West Wizard of Oz Set: Bones 3 Figure | H.A.W.K.S. 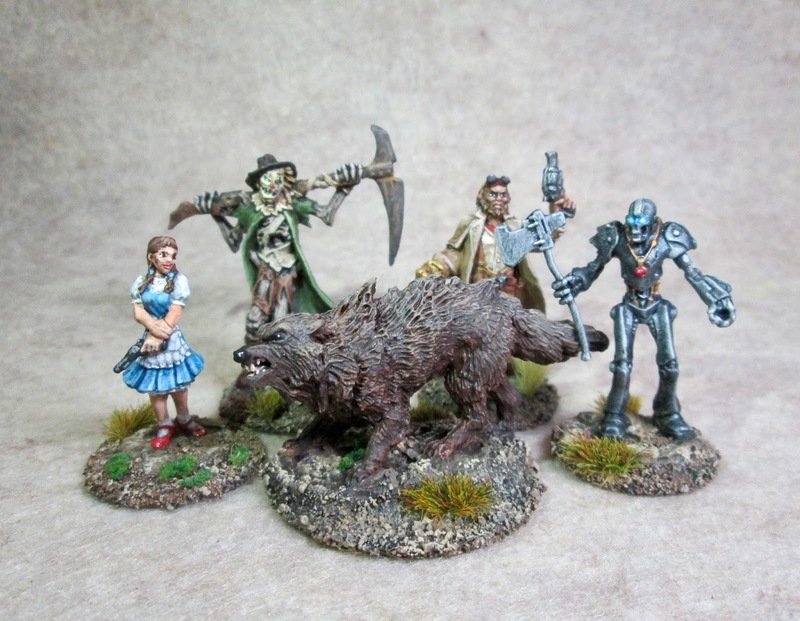 When I posted my Dorothy and Toto figures from the Bones 3 Wild West Wizard of Oz set a couple weeks ago; one of my readers, Lasgunpacker, asked that with all the other characters undergoing significant “post-apocalyptic” changes from the classic versions, shouldn’t Toto get a bit of an upgrade too? I immediately thought, “What a great idea!” and wondered why it had never crossed my mind before. 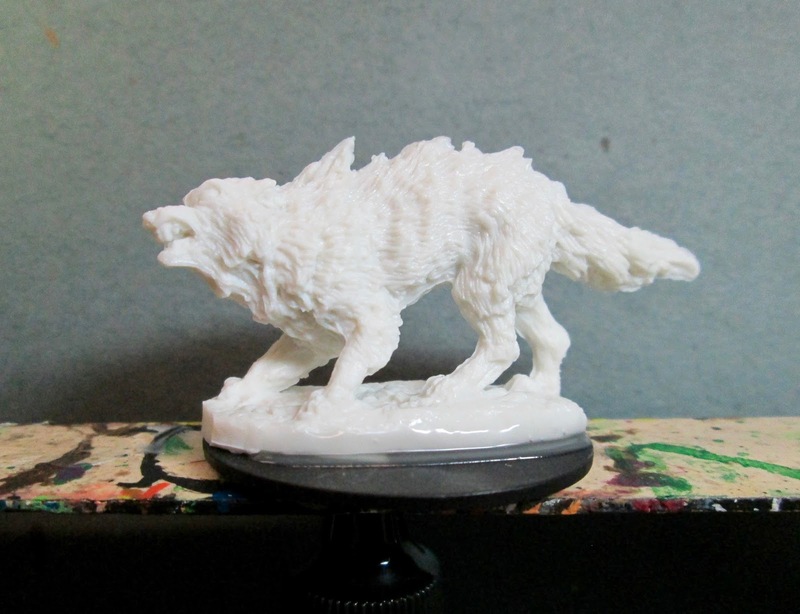 Luckily, I had the Winter Wolf figure from the Bones 3 Chill Out set; and since I had already painted the Warg from Bones 1 as an Arctic Wolf, I really didn’t need a second one in Winter colors. Next, I did a drybrush of Folk Art “Butter Pecan concentrating mainly on his back and head. I then gave him Black eyes, and muzzle, with tiny White highlight dots. After that I added a little hint of tongue wth Crafter’s Acrylic "Tutti Frutti”, and then painted his teeth with Americana “Antique White”, and then did highlights on them with Crafter’s Acrylic “Light Antuque White”. Lastly, I painted his base Americana “Bittersweet Chocolate”. 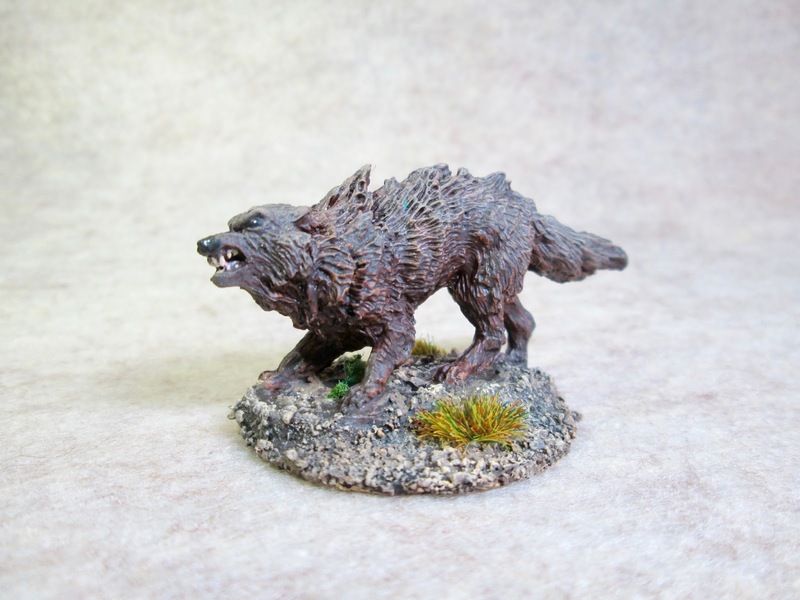 I let the wolf dry overnight and the next day I gave it a coat of Americana “DuraClear Matte” varnish. Then, when the varnish was dry, I used some white glue to glue a little coarse sand to the base. When this was dry, I painted the sand and the washer with the “Bittersweet Chocolate”. 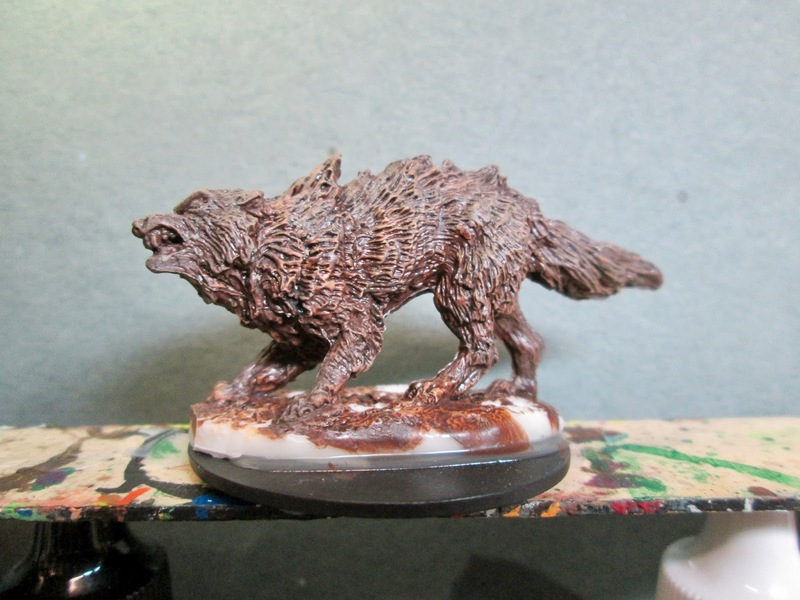 When the that was dry, I drybrushed the base with some of the “Territorial Beige”, and then some of the “Antique White”. 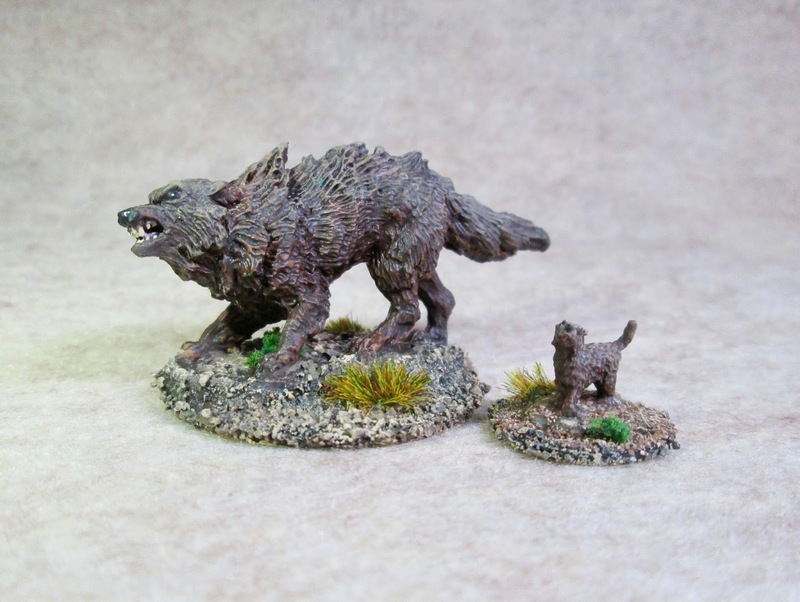 Lastly, I glued on some tufts of grass. A look at the whole gang together. I’m really happy with this upgrade to Toto. I think it works better with the feel of the set than the original plain one did. Toto 2.0 is pretty cool!